ES Gianalli represents fourth generation of Maplewood breeding. This mare’s history goes back to Greg Fratt, formerly with Patterson Arabians, who helped us find and purchase *Galia (Chazar x Gildia) and her daughter Gambria (by Negatraz) in the mid-80’s. They were our first Polish Arabian mares and possessed incredible beauty. We bred *Galia back to Negatraz producing Gambria’s full brother, *Gotcha, who was later exported to Sweden. Gambria produced only one filly for us, Giaa by *Pepi/Celebes. 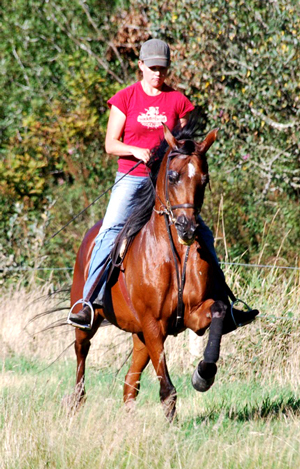 This breeding was encouraged by Tomasz Skotniki from Magness Arabians with the intent to produce an athletic beauty. Giaa was then line bred to Balagan (Negatraz x MHR Port Macja) for enhanced motion. The cross was a success! 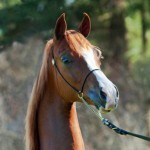 From the lovely bay ES Gianalli, we have retained her talented and Regional winning Halter colt G for our show string. Due to a foaling accident, she can no longer carry foals. She has been sold to carry on as a beloved companion riding horse. This entry was posted in Champions, Heritage and tagged progeny on October 15, 2013 by Anita Enander.